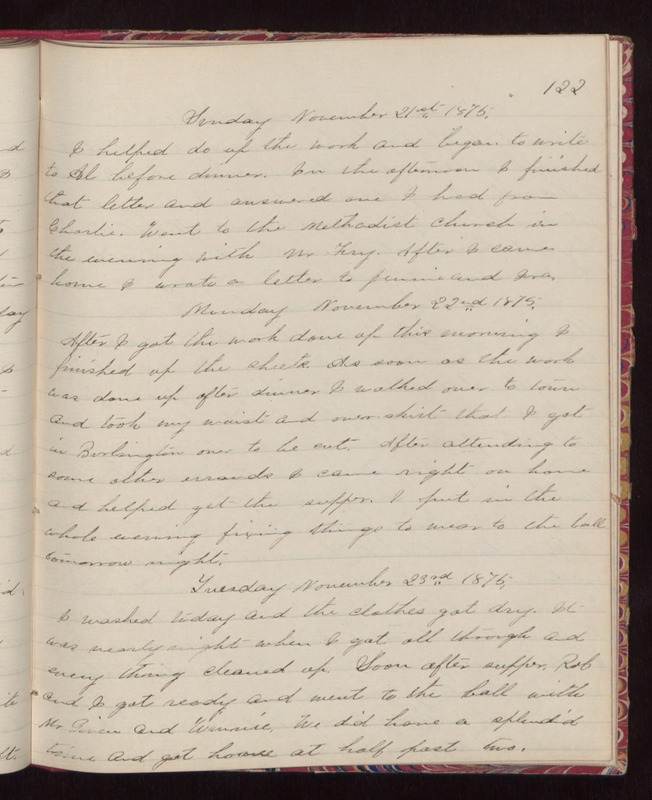 122 Sunday November 21st 1875. I helped do up the work and began to write to Al before dinner. In the afternoon I finished that letter and answered one I had from Charlie. Went to the Methodist church in the evening with Mr Fry. After I came home I wrote a letter to Jennie and Ira. Monday November 22nd 1875. After I got the work done up this morning I finished up the shirts. As soon as the work was done up after dinner I walked over to town and took my waist and over-skirt that I got in Burlington over to be cut. After attending to some other errands I came right on home and helped get the supper. I put in the whole evening fixing things to wear to the ball tomorrow night. Tuesday November 23rd 1875. I washed today and the clothes got dry. It was nearly night when I got all through and every thing cleaned up. Soon after supper, Rob and I got ready and went to the ball with Mr Given and Winnie. We did have a splendid time and got home at half past two.